More delicate, sweet and spicy floral flavor than the brown pods. Their lemony-eucalyptus accents add a sweet aroma to Indian sweets, puddings, yogurt and ice creams. The pods can be ground whole or shelled when adding to delicate dishes. 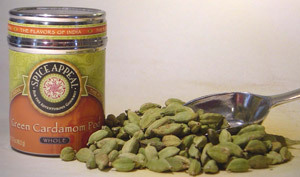 Add to teas, or grind with coffee beans to create a deliciously spiced “Arabic” style espresso. Adds a distinct flavor to Southeast Asian curries and pilafs.